The two men faced each other, sword drawn. They didn't know how they'd gotten there, and neither cared--they knew only that they had to face each other and fight, and that it was a fight to the death. "I don't want to kill you," Aragorn said, bending his head nobly. Valek shrugged, but didn't lower his sword. He didn't particularly want to kill Aragorn, either, but he wasn't too hung up about the whole thing. Aragorn feinted left, then brought down a blow on Valek's right. Valek blocked, but only just. 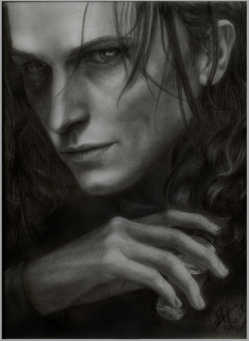 Aragorn's next blow connect, sending a stream of red blood down Valek's arm. "You're better at me in sword-play," Valek conceded. "Stronger." "I am a king and a warrior," Aragorn said. "I should be." Valek dodged Aragorn's next blow and danced away from the man. He knew he couldn't get far with a sword, not against this opponent. Aragorn, meanwhile, did not let up. He had carefully assessed the grounds, and knew that with a few more carefully aimed blows, he could trap Valek in the corner. Valek was distracted, fiddling with something on his belt. Aragorn used his distraction to his advantage, striking Valek just inches away from his original blow. Valek rolled with the hit and came up with three throwing knives. 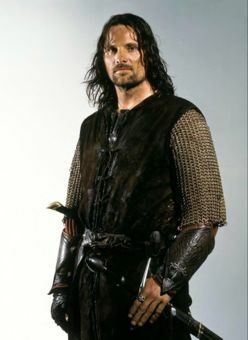 Using his uninjured arm, he tossed the knives at Aragorn. Two missed. Aragorn knocked the blade from his thigh, barely noticing the sting. "I'm sorry," he said, approaching Valek with his sword raised. "You are a noble warrior, but your knives are nothing compared to my blade." "Even with the poison on them?" Valek asked, grinning. Aragorn staggered. Poisoned blades. He'd not thought of that.